The Only Comprehensive Solution for Microbiomics and Metagenomics! Overcome bias in your microbiomics workflow by using ZymoBIOMICS™ Microbial Community Standards to compare different DNA extraction protocols. DNA samples were profiled by 16S rRNA gene targeted sequencing. Library preparation for shotgun metagenomic sequencing was performed in two different ways using Supplier A and an in-house method. Shotgun sequencing was performed on MiSeq with paired-end sequencing (2x150 bp). Raw reads were mapped to the 10 microbial genomes to evaluate the potential effect of GC content on sequencing coverage. Normalized coverage was calculated by normalization with the average sequencing coverage of each genome. 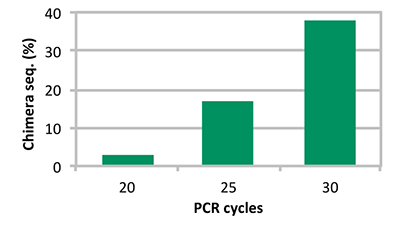 PCR chimera increases with PCR cycle number in the library preparation process of 16S rRNA gene targeted sequencing. 20 ng ZymoBIOMICS™ Microbial Community Standard was used a template. The PCR reaction was performed with ZymoTaq master mix and with primers that target v3-4 region of 16S rRNA gene. Chimera rate in percentage was determined with Uchime and using the 16S rRNA gene of the 8 bacterial strains in the standard as reference. Have questions? Need more information? Contact us at tech@cedarlanelabs.com to have all your questions answered in a timely and professional manner. Note: This offer is not valid in conjunction with contract discounts or any other special pricing. Void where prohibited.